I don't think you can successfully buy a camera bag on the Internet without seeing it and trying it with your own gear. I've tried buying without seeing live and proven my contention correct 100% of the time. So I am really looking forward to seeing this new gear in a real brick and mortar camera store. Let's take a look. We will start with the very popular messenger bag layout. Think Tank Photo was one of the first true bag companies to do a messenger style bag that wasn't horrible. That series, called the Retrospective continues to grow. The latest is a new colour, Sandstone and a new model the Retrospective 6. It is a medium sized shoulder bag in the messenger style and is sufficiently deep front to back to take a DSLR with a battery grip. This is a requirement for me as every DSLR I use is either a one piece with grip or has a battery grip added on. It's also completely layout flexible because of the moveable divider system common to Think Tank Photo products and can carry an 8" tablet safely along with your gear. If you shoot one of the expanding mirrorless lines, that are doing pro grade lenses like Olympus and Fujifilm, you'll appreciate the spacing flexibility that will hold your gear but not so much that you overload yourself. Next up is the Production Manager 50. Let me get this out of the way. I WANT ONE. The idea that I can carry C stands, modifiers and multiple studio strobes in a single roller bag that I can move around by myself is very exciting. This bag, you could certainly overpack. One of the sample images has a pair of big Profoto packs in it. You'd need a rather burly person to heft that off the ground., but I already see use cases for this bag. The Production Manager 50 - Ross want! As you can see from the images, there is a lot of space in this bag, and if you watch the video on the Think Tank Photo site, you'll see the attention to detail that went into this thing. The Production Manager 50 joins the Logistics Manager 30 and the Production Manager 40 by growing to offer internal space of 15.6" x 49.2" x 10" The dividers are built so there are slots specifically for C stands with removable bases in addition to your light shaping tools, heads and related paraphernalia. At just under $600 USD, it sounds expensive right until you consider the value of all the gear it is protecting and making easy to move around. As with all Think Tank Photo bags, not only do you get more dividers than you could ever use, they are also tough and stable, meaning that while they separate your gear they also protect it. There are of course pockets and pouches as well as straps so you can attach larger poles or stands to the side of the bag, but please be cautious as the bag may be able to carry more than you can. Between workshops and shoots the last couple of weekends, I could really have broken one of these guys in quickly. It would save space in the vehicle and eliminate the need for me to carry and manipulate a collapsible gear cart and bunch of duffel bags. 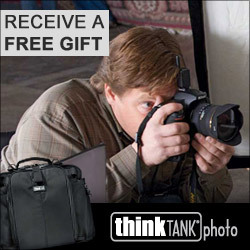 If you're looking for the best in camera and related gear bags, you don't have to look farther than Think Tank Photo. They have never let me down, and when I talk to pros who go on the road, their bags are from Think Tank as well.